As a premier supplier of barns in the Perth area, we would like to take this opportunity to remind you that winter is a great time to replace your barn. In Perth, we don’t have it nearly as bad as they do in many other parts of the world, but winter still isn’t a bargain by any means. Sure, we don’t get four months of snow–as many climates do–and it seldom freezes here. But there is always the risk of cold weather, and there isn’t as much to do on a farm in the winter months. 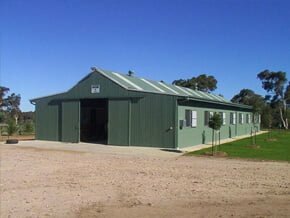 At Action Sheds Australia, though, we think winter is the best time for erecting barns, farm sheds, or machinery sheds in Perth, and all of WA. First of all, the chill of winter, while not debilitating as it is in other climates, is enough to make work more efficient. People don’t get nearly as hot, and are able to work longer and harder in the temperate weather. While most of the rain in Perth does happen in the winter, it still isn’t really a lot, and it doesn’t interfere with erecting a barn or a machinery shed. Lately, most severe weather in Australia has happened in the hotter, summer months. If your barn is in need of replacement, it is a lot more likely to create an emergency situation for you in the severe weather of summer than it is in the winter. In other words, if your old barn made it through another summer, rejoice; but make sure to replace it before next summer’s inevitable severe weather comes along with its prerequisite risk of destroying an old barn. At Action Sheds Australia, we are ShedSafe accredited. For you, that means a lot of things–and all of them are good. First of all, it means that every step of our process is dedicated to providing the safest shed we can provide. Every one of our staff is up to date with the new shed safe regulations. Everyone on our staff is required to know everything that it takes to ensure the safety of your barn or machinery shed. Perth and all of WA have specifications related to our climate, and every one of those specifications is taken into consideration when we recommend or erect any ShedSafe certified shed or barn. When we give you a quote, we will provide a wealth of information for you, which is all considered when recommending any shed or barn. The wind region is the first thing we consider. Every possible location has a wind region number. This is determined by projected wind speeds. The importance level is another consideration. For example, a barn with animals in it will be subject to more stringent standards than a seldom-used storage shed. We also take the terrain into consideration as this affects wind speed. The topography factor also affects wind speed. A barn can be at sea level, on top of a hill or on a slope; all of these make a difference. Another factor is how close your barn or shed is to a permanent structure that could shield it from wind. When we put it all together, we estimate a site wind speed which we provide for you in metres per second. Obviously, the higher your wind speed number, the stronger your building will have to be to withstand that wind. We sometimes take the wind for granted, but it is blowing every second of every day. This exerts a lot of force on any building. If your barn is becoming old and the structure is becoming compromised, even a small problem can become big, faster than you would think. What does this all mean? The bottom line is that you can’t trust an old barn to make it through another summer like the last few, and it is best to replace it in the winter before it is too late. We offer American Design Barns and Aussie Design Barns. Each design has a 10- year guarantee on the structural elements and a 15-year guarantee on the cladding. We offer many colours and a custom colour chart, too, which allows you to colour different elements as you please. We offer many optional extras, such as a personal access door, motorised roller doors, windows, roof ventilators, Colorbond sheeting, mezzanine floors and many other options. If you think your old barn is ready to be put out to pasture, call 1300 778 628 today. Summer will be here before you know it. Is your barn ready?